As an object of economic value, jadeite (feicui)—the highest valued type of jade in China—seems subject to boom and bust cycles in China’s current economy, not unlike stocks, real estate, or gold. While jadeite has seen spectacular price rises in the past three decades, parts of the industry took a blow in 2014, which Chinese traders generally ascribe to two factors: declining economic growth and Xi Jinping’s anti-corruption campaign. However, institutional factors are not sufficient to understand the long-term trajectories of the markets for jadeite in the Chinese context. Jadeite is considered a sub-type of jade (yu), which in the form of nephrite has been valued in China for at least eight thousand years. Over this long history, jade has assumed culturally specific connotations and properties that make it highly desirable for Chinese customers—a situation that may suggest that its markets are not likely to disappear. Jadeite has reportedly trickled into China from mines in Myanmar’s Kachin State since the thirteenth century. Legend has it that the material was first imported into China’s Yunnan province along one of the ancient caravan trade routes that linked Yunnan with Myanmar and India. Supposedly, a Yunnanese muleteer picked up a stone in Kachin state and put it in his saddlebag as a counterweight to his cargo. Back in Yunnan, the stone fell to the ground and broke into pieces, revealing a green interior. But jadeite did not leave a strong impression in China until the Qing emperor Qianlong (1735–1796)—who was obsessed with jade—started to demand large-scale imports of the stone as tribute from the Burmese King Bodawpaya in 1788. Emerald-green jadeite with high transparency and translucency was then called ‘Imperial Jade’ (diwang yu). Today these Qing-era criteria still function as a standard to evaluate the quality of jadeite types. In 1860, during the Second Opium War, French and British armies sacked the Summer Palace in Beijing. On that occasion, many jade artefacts—including Burmese jadeite—were looted and brought to Paris and London. In 1863, French mineralogist A. Damour determined the chemical properties of this ‘new’ jade, and named it jadeite. Jadeite is chemically distinct from the more common nephrite jade, which is mined especially around Hetian, in China’s Xinjiang province, but both materials are considered to be jade due to their similar observable properties. After the communist takeover in 1949, the Myanmar-China cross-border trade withered, and the bulk of the jadeite trade was diverted to other routes. One route went through Myanmar’s Shan State to markets in the northern Thai city of Chiang Mai, which catered specifically to buyers from Taiwan and Hong Kong. Alongside local ethnic groups, remnants of Chiang Kai-Shek’s nationalist troops in Myanmar’s Shan State also transported the stones, which were locally taxed by different ethnic armies. Another route saw jadeite brought to Rangoon, and then shipped to Taiwan and Hong Kong. Different Kachin tribes have taxed jadeite in the Kachin State for centuries. The Kachin Independence Army (KIA), which was established in 1961, and has since fought the Burmese military for greater autonomy for ethnic Kachin in the Kachin State, took control of the mines in 1963, and centralised taxation. With the opening of border crossings between China and Myanmar for trade in the early 1990s, increasing Chinese involvement in natural resource extraction in Myanmar, and a gradual shift in demand towards mainland China, jadeite transport shifted towards routes that run overland from the Kachin State into China. The main point of entry became the border town of Ruili in Yunnan province, which since 1990 has seen the establishment of a Special Economic Zone (SEZ) for border trade, as well as upgraded infrastructure in the form of highways and a projected railway line. Following a ceasefire agreement between the KIA and the Myanmar military in 1994, the Myanmar military government gradually took over the most profitable jadeite mines in Kachin State, and leased mining concessions to their cronies and to Chinese investors. By 2002, the Myanmar military government had offered up to nearly one-fifth of the area of Kachin state for private mining concessions, and by the mid-2000s, the government required all gemstones produced by joint ventures to be sold at annual government-organised auctions in Yangon and later Naypyidaw, as this was the easiest way to tax all sales. Total taxes in Myanmar amount to around 30 percent of the estimated sales value of a stone, and a similar import tax is officially levied at the Chinese border in Ruili. In practice, both taxes are often lowered or avoided by bribing officials, valuators, and border guards, or by smuggling the stones across the border—it is estimated that up to 80 percent of the stones that are brought to China enter the country illegally. A report by Global Witness estimated that the value of official jade production in Myanmar in 2014 was 31 billion USD, a figure equal to 48 percent of Myanmar’s official gross domestic product and 46 times the government expenditure on health for that year. The bulk of that jadeite goes to China. Meanwhile, the native Kachin people have lost crucial revenues from the jadeite mines, while facing rampant heroin addiction, HIV infection, environmental degradation, and dangerous working conditions in the mines. In June 2011, the ceasefire between the KIA and the central government collapsed, and the ensuing violence resulted in the death of thousands of people and the displacement of around 100,000 civilians in the state. 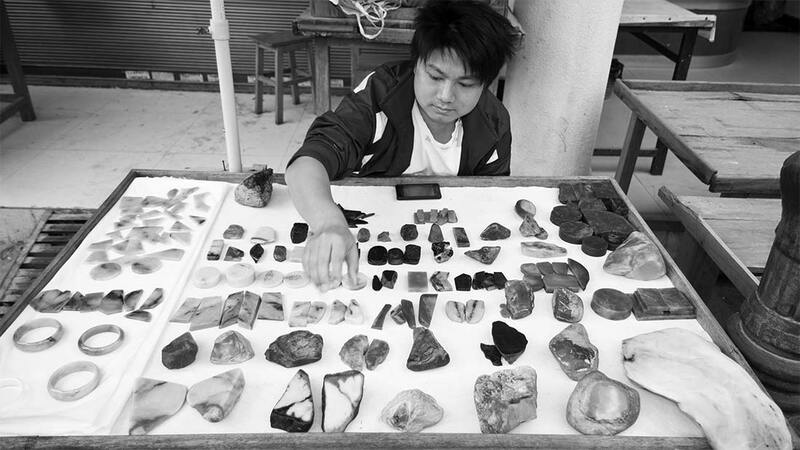 In 2013 and 2014, I conducted fieldwork among jadeite traders and carvers in Ruili. The city’s registered population was 187,000 as of 2012, comprising Han Chinese (57 percent), Dai (30 percent) Jingpo (7 percent), as well as a host of other minority groups. There are also around 35,000 unregistered Burmese, including some 15,000 Rohingya in Ruili. Around 60 percent of the Han Chinese are locals, while the rest are immigrants from cities in eastern Chinese provinces with long traditions in jade carving and trading—such as Henan, Zhejiang, Fujian, Jiangsu, and Guangdong. A local government official I interviewed in 2013 estimated that at least 50,000 people in Ruili are directly involved in the formal jadeite trade, a figure that does not include freelancers. The city hosts six major jadeite markets and around 8,000 shops. Many traders are organised in jade trade associations based on ethnic or regional affiliation. Thanks to their broader access to investment capital and buyers in coastal China, Han Chinese control the largest companies. Some traders buy jadeite boulders at the government-organised auctions in Naypyidaw; others purchase stones in Mandalay, which are later brought into Ruili by professional transporters who take advantage of personal connections at government checkpoints. A subset of traders have stones smuggled in directly from the mines in Kachin state. People of Kachin/Jingpo ethnicity mainly work as suppliers, while Shan/Dai peoples operate as shop owners, and the Rohingya and Bamar as cutters, polishers, and street vendors. Some Rohingya and Bamar act as middlemen, selling stones for others. Depending on profits, they usually receive 10 to 15 percent of the sales price. Others catch customers in the street and bring them to shops, where they receive 20 to 30 percent of the profit on deals they facilitate. Some purchase jadeite for themselves and sell it in the street. Traders say it takes around 10,000 yuan in start-up capital to set up a small business as a mobile vendor. However, the real profits are in the trade of high-quality stones, which is much more capital intensive. In the Han trader community, operational capital usually comes in the form of informal credit between traders—often with jadeite used as security—as banks do not provide loans for this activity. As a general rule, you can borrow 50 to 70 percent of the estimated value of the jadeite you deposit with the creditor at a monthly interest rate of 3 to 5 percent. What Is the Future of China’s Jadeite Trade? In 2013, Ruili’s jadeite trade was booming. Caravans of buses arrived daily, delivering tour groups to the doorsteps of jadeite companies, which paid a percentage of their profits to the tour guides. Some traders said that jadeite prices had been rising up to 300 percent annually since 2009, and most believed prices would continue to rise, not least because supply was diminishing due to the conflict in Kachin state, and because the mines were allegedly depleting. However, when I arrived in Ruili again in 2014, the tour buses were gone, trade was slow, and many smaller shops had closed down. Traders ascribed the market implosion to the slowdown of the Chinese economy and to Xi Jinping’s anti-corruption campaign. Jadeite is a favoured form of gift and payment for illicit favours in China. As economist Thomas Naylor, who has studied illicit trade in gemstones, points out: ‘In their role as financial assets, gemstones have particularly desirable characteristics. High in value relative to bulk, they are easy to hide and to smuggle; they are universal and very liquid; and they can be sold via marketing networks whose members share an affinity for “discretion”.’ In the anti-corruption era, few people dared to engage in illicit transactions using jadeite as a currency. However, jadeite traders with enough capital to sit out the market slowdown or to divert their investments were still optimistic. While demand for medium-priced jewellery had taken a blow, prices for high-grade jadeite were still rising. In 2013, the owner of a large jadeite company where I did parts of my fieldwork used to specialise in selling medium-priced jewellery to tourists. The following year, he closed down that company and started a new one with a Chinese man from Myanmar, who had acquired mining licenses in the Kachin state. A stone excavated from one of these mines weighed more than six tonnes and was sold to a Shanghai investor for 600 million yuan, roughly 90 million USD. Echoing other traders, the company owner said that there would always be a demand for jade in China. This has to do with traditional Chinese beliefs regarding the function of jade in the corporeal and spiritual lives of people. Jade is believed to have at least six functions: stimulate good life energy (qi), absorb bad life energy, and condition blood pressure; protect people from accidents; bring good luck; transmit spirit (ling) and karma (ye) between people, for example as gifts and inheritance objects from mother to daughter; help people contemplate the universe and their place in it; and make people feel at peace. While institutional factors may explain the slowdown in the Chinese market for medium-priced jadeite jewelry since 2014, the persistence of these beliefs suggests that China’s jadeite market boom may not be over yet. 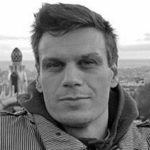 Henrik Kloppenborg Møller is a PhD Candidate at the Department of Sociology, Lund University, and a visiting PhD candidate at Yunnan Minzu University. He has done long-term fieldwork among Chinese vendors of counterfeit goods in Shanghai and among jade carvers and traders in southwest China and northern Myanmar. His research interests include relations between materiality, knowledge, authenticity, value, and identity in China.